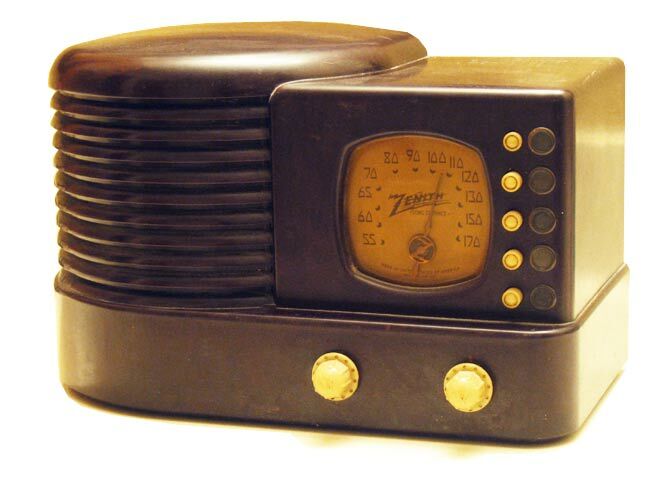 Affectionately known by collectors as the "Zenith Beehive" because of the distinctive and appealing cabinet appearance, the Zenith 6-D-312 was introduced in late 1938 at a price of $19.95 and featured automatic tuning for up to 4 preset stations. The bottom pushbutton selects manual dial tuning. The cabinet design was used for several other models including the farm battery-powered 4-K-310 without pushbuttons and the AC-only 5-R-312 that uses a power transformer. The 6-D-312 contains a ballast tube so it can be AC or DC powered. Also the later 1940 and 1941 models including the 4-K-515, 6-D-512, 6-D-516, and 6-D-616 used the same overall cabinet design with a larger square dial opening.